THE COVERUP OF THE U.S.S. IOWA. Although the Carrier Battle Group has drastically altered the doctrine of fleet operations in the modern age, four WW2 battleships which had been mothballed were given extensive modernization upgrades and returned to active duty during the Reagan years. One of these ships was the U.S.S. Iowa. The chief armament of the Battleships are her sixteen inch guns. Little changed from WW2 days, they are loaded by first ramming, with a pneumatic ram, a mission specific projectile into the bore followed by the propellent. The propellent is bundled in silk bags, with the number of bags determining the total charge in the gun (normally 6). The propellent is rammed in behind the projectile and the breach is closed. 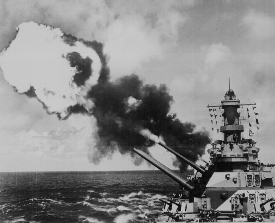 Upon command to fire, the center gun on the number one turret fires, and radar tracks the projectile. A correction is computed and the remaining guns adjust themselves and fire. On April 19th 1989 was 330 miles northeast of Puerto Rico on a training cruise. At 9:55 A.M. during the loading cycle, the center gun in the number 2 turret exploded with an open breach, sending a blast wave into the turret that killed 47 sailors. The combination of a close friendship with one of the dead sailors, Clay Hartwig, plus some lead foil and a "Gung Ho" magazine led the Navy to accuse 21 year old Seaman Kendall Truitt (who was married) of having been one half of a failed homosexual love affair with Clay Hartwig, with his jilted lover then committing suicide in the number 2 turret. The ferocity with which the Navy pursued this line of investigation made it apparent that there was another line of inquiry being hidden. Deliberate press leaks by the Iowa's Executive Officer to the Washington Post painted a picture of an unhappy gay sailor blowing himself and 46 of his fellow seamen into eternity. The story was then picked up by The New York Times and the Los Angeles Times. The Newport News Daily Press and Times Herald interviewed Truitt, promising him anonymity, then ran his name as page one news anyway. Meanwhile, the Navy had discovered that the bags of propellent, dating from the Korean war, had been improperly stored for 5 months in temperatures exceeding 90 degrees, the point at which the propellent becomes unstable. The Navy's investigation also showed that the freshman sailor operating the rammer had over-rammed the propellent, 5 bags instead of the expected 6, slamming it into the warhead. In response to accusations that the propellent was unstable, the Navy decided on a demonstration, and built a "drop test" rig. This was a simulated 16 inch gun barrel, with a ram at the base, that was dropped onto a concrete block to simulate over-ramming. The intention was to drop test the configuration again and again until it was evident that the propellent inside was safe from accidental detonation from over-ramming. Exactly the opposite was proven. On being dropped, the device detonated. The Navy then destroyed the remainder of the Iowa's propellent store and established new rules for the storing of propellent. Despite this and other facts, the Navy's official report, issued on Thursday, September 7, 1989, concluded that the disaster was caused by a "wrongful intentional act ... most probably committed" by Clay Hartwig. This is the key point. Even with the correct cause of the explosion in hand, the Navy willfully and falsely accused Clay Hartwig of a deliberate crime, and destroyed Kendall Truitt's life and career as well. Truitt's statement to Navy investigators have never been made public. seeing inside the damaged gun turret. of water, hydraulic fluid, blood, and body parts. trips into the turret to find the bodies of his friends. single-handedly responsible for averting a much greater catastrophe. accident, the Navy acknowledged his heroic performance. rumors regarding homosexuality and possible complicity in mass murder. sealed off from the rest of the turret by explosive-proof walls. saved their lives that morning. only light. The room was filled with smoke and the strong odor of gas. bodies of three men could be seen frozen upright holding a fire hose. and returned to the magazines near the burning powder charges. he was determined to stay at the scene and "help as much as possible." are branded in his mind. modest Truitt was a hero. say a few words to the media. His wife Carole recalls the day vividly. parents could collect on the premium. the newly opened criminal investigation. scene, they were convinced that they had seen two men embracing. set the "homosexual lovers" theory in motion. plunged ahead in its rush to find a culprit. been found in his possession. December 1988, Hartwig had a falling-out with his friend. The N.IS. the case was starting to take shape. turned around to establish him as a cold-hearted conniver. pulled out bodies, I ID'd bodies, I made seven trips into the turret. investigators then asked to search Truitt's house. Again he agreed. they had done," Carole recalls. "1 cried for an hour after they left. It was like I had been raped." be homosexuals. That is just a big lie." befriend Hartwig, and he told the other sailors to "knock it off." even remember the last time they were in France, they were so trashed. a bar and get drunk." to be spending all of my free time now with Clay since I had Carole. Within days of its commencement, the N.I.S. investigation was stymied. tried the case in the national media. "Raw intelligence data,"
otherwise known as unsupported gossip, was leaked to the press. the investigation as a suspect. to extend their stay until everything "cooled down." cleansing foil common to gunner's mates. and Ted Bundy. I felt very helpless." it was too late to help him. The damage was done. they were going to put me in jail for something I didn't do." good-bye to friends. "It was an emotional visit for me," Truitt says. aluminum-covered barges was often 25 degrees hotter than outdoors. bypassed the overcooked powder that found its way onto the Iowa. center gun had been rammed in more than 22 inches farther than normal. explosion, was the likely answer. ... most probably committed" by Clay Hartwig. Separate from the N.I.S. been widely disseminated in the press sullying Truitt's reputation. sealed barge vary, rendering only some of the charges dangerous. for the primer and for hoisting powder. court. Microscopic particles found in the gun were subjected to F.B.I. particles belonged to a detonating device. "little problem," or would he have sounded an emergency alert? counter to suicide. The Navy ignored these findings. of doubts about me, and none of it is true or fair." the lives of other innocent young sailors." Truitt was hailed as a hero. The Gays and Lesbians Comment. 47 sailors in April 1989.
probably" intentionally caused by Hartwig. absolutely no basis in fact." coverage of issues that concern gays and lesbians.